Most REALTORS®, Real Estate Agents and Property Managers are road warriors – constantly on the go with ever increasingly busy schedules. Wouldn’t it be great if an app could help them find more time in the day? It’s possible with the LifeTopix app from LightArrow. Real estate professionals often use devices such as iPhones and iPads to search for listings, to communicate, and to stay productive. Great news. The availability of useful mobile apps for these professionals is becoming more widespread as mobile devices gain popularity, making their lives easier. Many LightArrow customers are real estate agents and property managers. Many use the LifeTopix app to manage and consolidate their busy schedules, contacts, service providers, documents, and more into one place. In fact, because such a large number of LightArrow’s customers are real estate professionals, LightArrow is planning to implement a solution customized for them using the LightArrow App Engine. This post focuses on what the LifeTopix app offers real estate professionals today, and how these professionals are using the LifeTopix app to organize and manage their schedules, business information, and more. Open Houses and other Events – Plan open houses and other events. Checklists – Create home selling or buying checklists and share checklists with clients over email. Properties – Manage a list of properties with specific details through LifeTopix Assets. Calendar – Stay on task and on time. Consolidated Appointments and Reminders – Events and reminders from the iOS Calendar and Reminder apps are consolidated into one place. 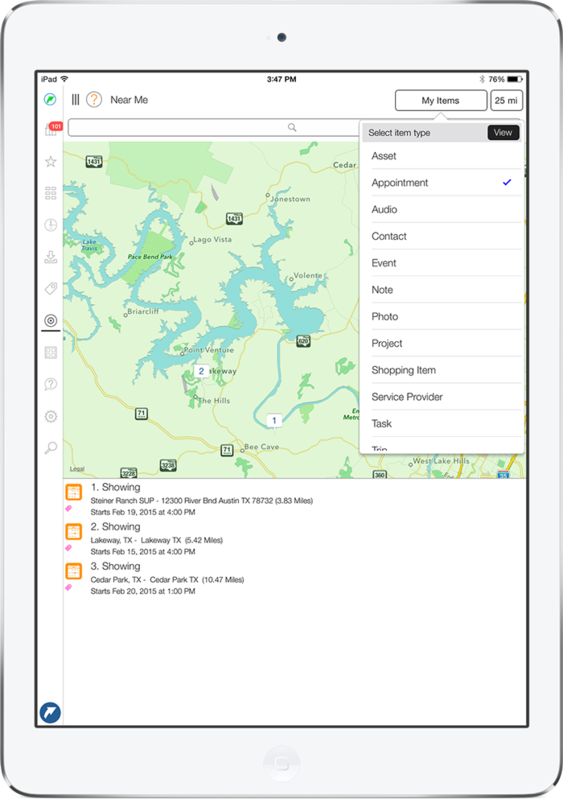 Location Services – Plan showings by location. Passwords and Private Information – Keep track of usernames, passwords, and secret text such as security and gate codes. Document Management – Easily organize and retrieve documents stored in Dropbox, Box, Google Docs, and OneDrive. Information Management – Gather information from multiple channels (email, social, web, and more) and make that information actionable. Expenses – Keep track of marketing, entertainment, travel, or other expenses. Contacts – Keep track of clients (custom statuses, contact logs, custom forms, alerts, and more). 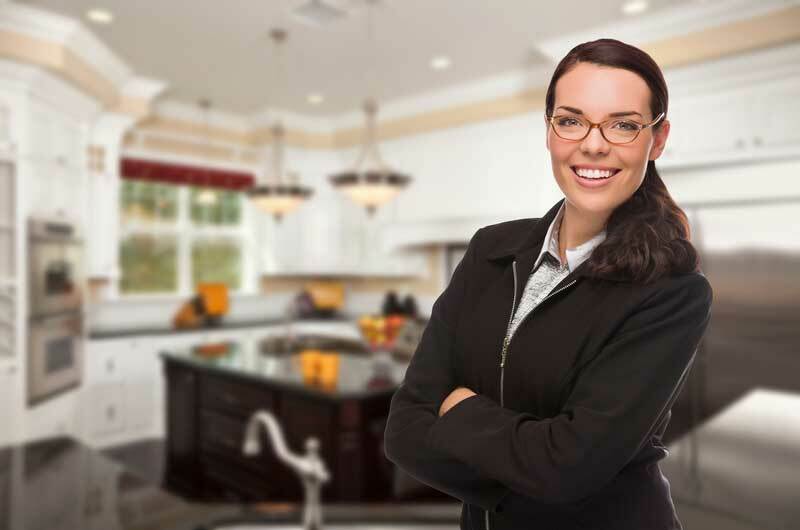 Service Providers – Keep track of title companies, Escrow companies, lenders, inspectors, general contractors, real estate investors, handymen, etc. All of these items are naturally connected throughout the app; therefore, it’s not necessary to enter items over and over again as in disconnected apps. Keep reading to see examples of how the LifeTopix app can help real estate professionals in the above areas. Keeping track of details when conducting open houses and other events can be challenging for real estate professionals. With LifeTopix, they can create a LifeTopix Event and invite prospective buyers to the open house via email within the app. The app makes it easy to keep track of responses and communicate with invitees, as shown below. 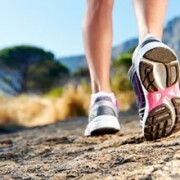 LifeTopix also makes tracking details for events easy. For example, when an event is created, all information associated with the event can easily be connected with it; making it easy to find the important information. 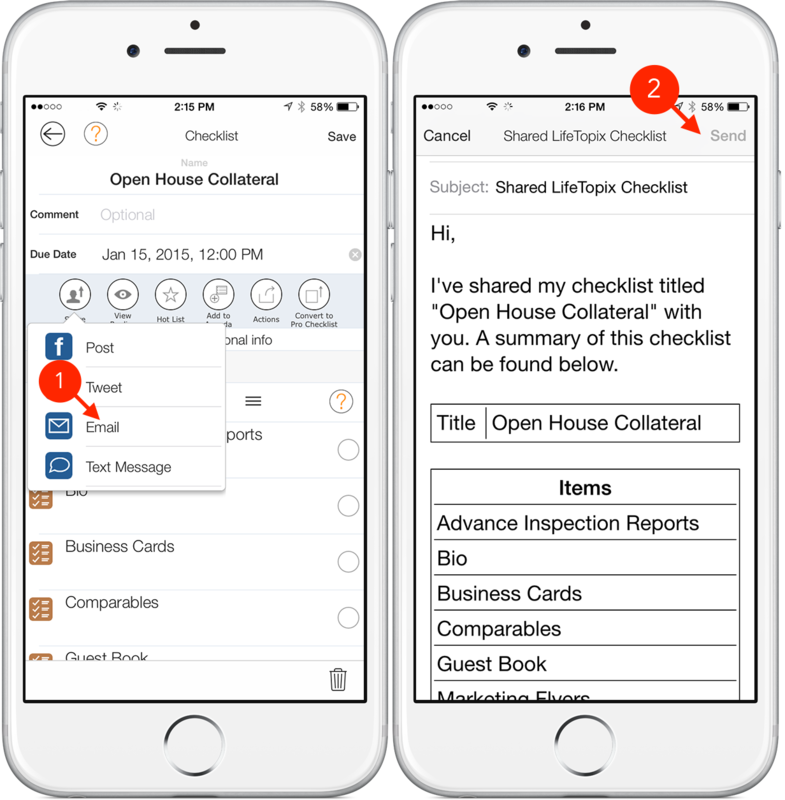 Keeping track of to-dos, open house checklists, maintenance lists, and other items such as client “must-haves” for a new home is easy with LifeTopix. For example, real estate professionals can keep track of items that they and a seller must complete before an open house event occurs. Real estate professionals can easily create and share checklists. These checklists, shown below, are printable, reusable, sortable, and shareable via email. It’s important for busy real estate professionals and property managers to track details for the properties they’re buying, selling, or managing. In LifeTopix, real estate professionals keep track of property details through the Home + Assets topic. Within an asset, real estate professionals can record seller details, purchased cost, current values, manufacturers, models, mapped locations, and context tags. They can also associate tasks, appointments, reminders, notes, checklists, files, bookmarks, expenses, services, audio recordings, photos and videos to the property asset. With these associations, for example, when an appointment is added to an asset, the details of the property are automatically associated with the appointment (which displays on the calendar). This makes it easy to find all the details of the property in one place. An example of an asset created for a property in LifeTopix is shown below. 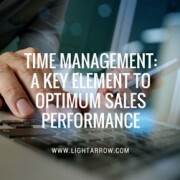 LightArrow understands that real estate professionals juggle a mountain of appointments and tasks. LifeTopix provides them with versatile calendar views for their iPhone or iPad. 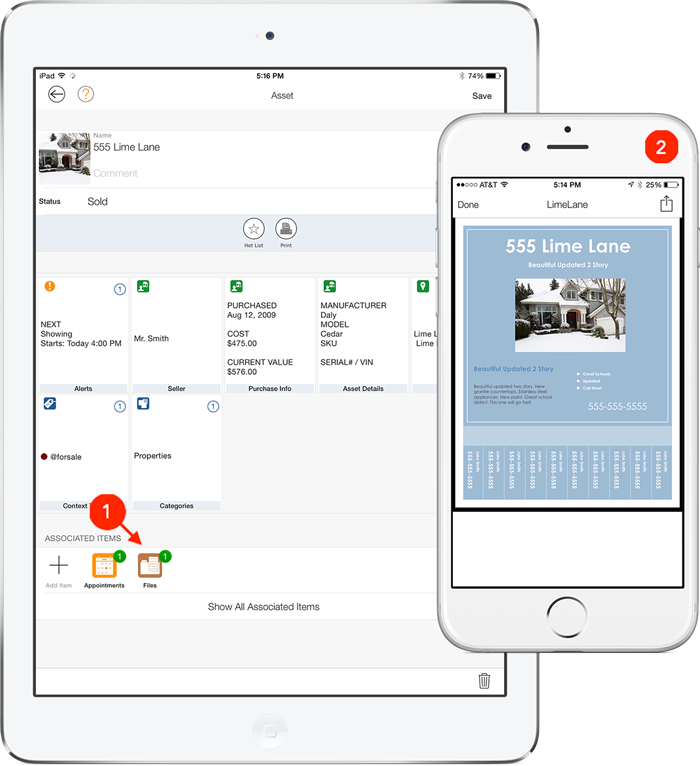 It helps real estate professionals manage showings, meetings, projects, to-dos, reminders and more all in one view, saving valuable time. 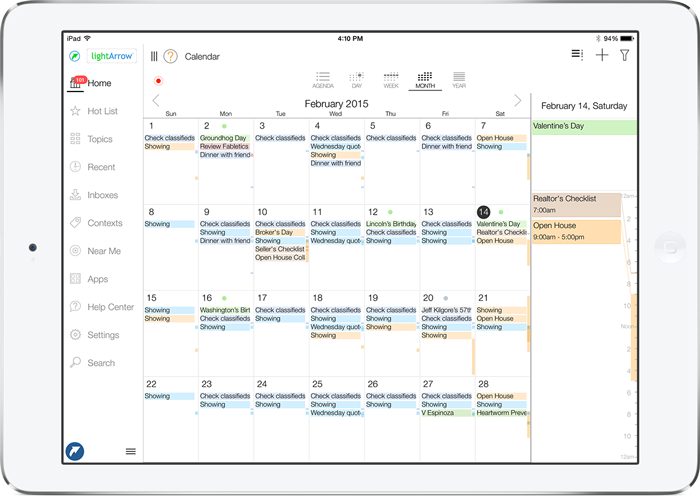 LifeTopix also includes a printable daily agenda and day, week, month, and year views – configurable to individually show or hide events, such as appointments, tasks, trips, projects, checklists (to-do lists), notes, and items from the iPad or iPhone calendars. With LifeTopix, the real estate professional can effortlessly switch to and from views and easily search for any data item. Calendar item types, events and items from different calendars are differentiated by colors, as shown below, making it easy to take control of a busy schedule. 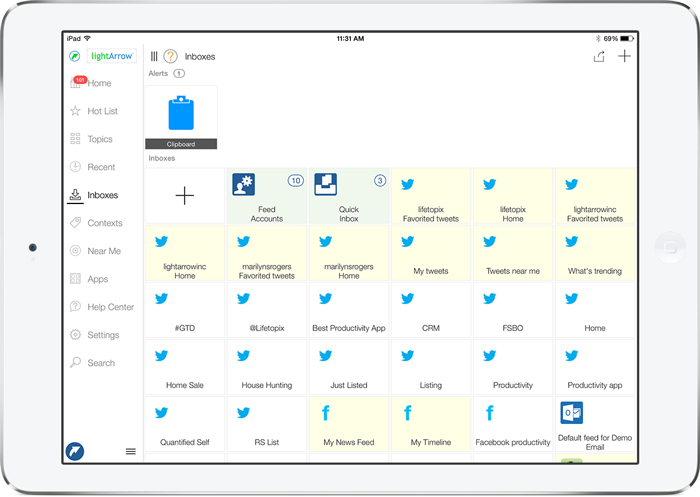 Many real estate professionals use a task management app or checklist app, the iOS reminders app, and the iOS calendar. LifeTopix is integrated with the iOS calendar app – resulting in a calendar that unifies all the calendars that the iOS calendar supports (Google calendar, Outlook, etc.). 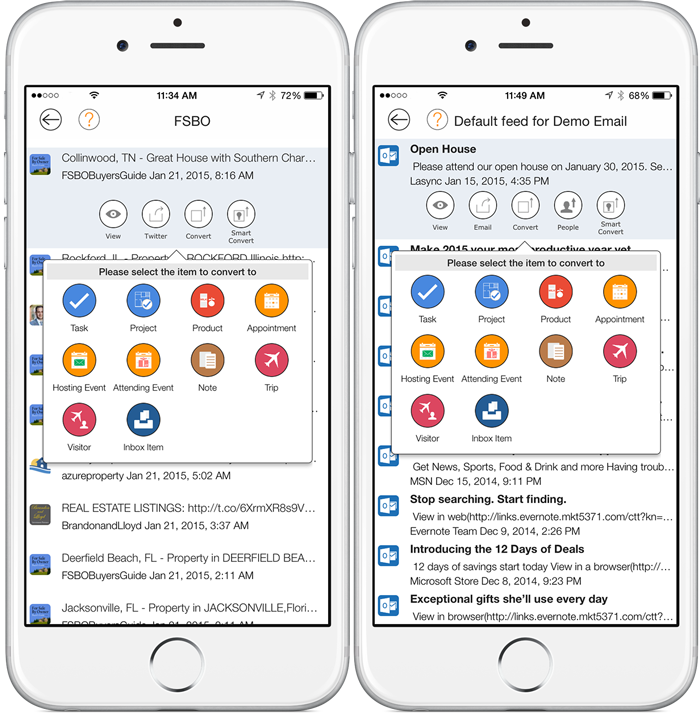 Furthermore, LifeTopix integrates with the iOS Reminders app and it also includes built-in task management and checklists. With LifeTopix, all of this information is combined into one view – giving the real estate professional one-tap access to what’s important to him or her today, tomorrow and in the near future. This is all combined into their daily Agenda view, as shown below. With LifeTopix’s location-based view of appointments and other items, real estate professionals can better plan their days based on the locations of showings, closings, meetings, and other appointments. The built-in map automatically picks up the appointments that are on the radar within a radius that they specify. In addition, the real estate professional can pick the types of items that show on the map. For example, they might wish to view appointments, but not contacts. They can easily choose this option through the picker that’s made available in the Near Me view. An example of the Near Me view (with the picker open) is shown below. Real estate professionals are required to keep track of multiple passwords for several online sites and private information such as security codes for properties. LifeTopix includes a secure password manager and private information organizer with strong, military-grade 256-bit AES encryption for usernames, passwords and any private notes, photos and audio. This feature helps real estate professionals find this information easily and securely, while on the go. Real estate professionals manage several different types of documents and files including marketing flyers, contracts, photos, and more. LifeTopix works with several cloud services where documents are stored, which allows these professionals to associate documents with items (such as property assets or contacts) in LifeTopix. There are several advantages to cloud service integration. Real estate professionals can easily organize, find, and view important documents such as photos, contracts, and marketing materials on the go (no laptop required). In the example below, a flyer is associated with a property (asset) in LifeTopix. Today, savvy real estate professionals are using various social media channels to gather information and to market their companies and properties. In addition, these professionals receive dozens of email messages every day. Information is also received from a variety of other channels (phone, notes, face-to-face conversations, etc. ), which makes keeping up with it all practically impossible. This is why LightArrow created “Inboxes” (available with the Pro Inbox Pack in-app purchase) in LifeTopix, which is shown below. Each tile in the screenshot represents a different channel such as a Twitter feed, Email feed, Web feed, and Facebook feed (all filtered by chosen keywords and other options); and Quick Inbox entries (ideas generated during conversations, research, etc.). Using social media requires listening and acting on the information that’s gathered. LifeTopix is an excellent app for gathering information through social media and other channels – and communicating with others. 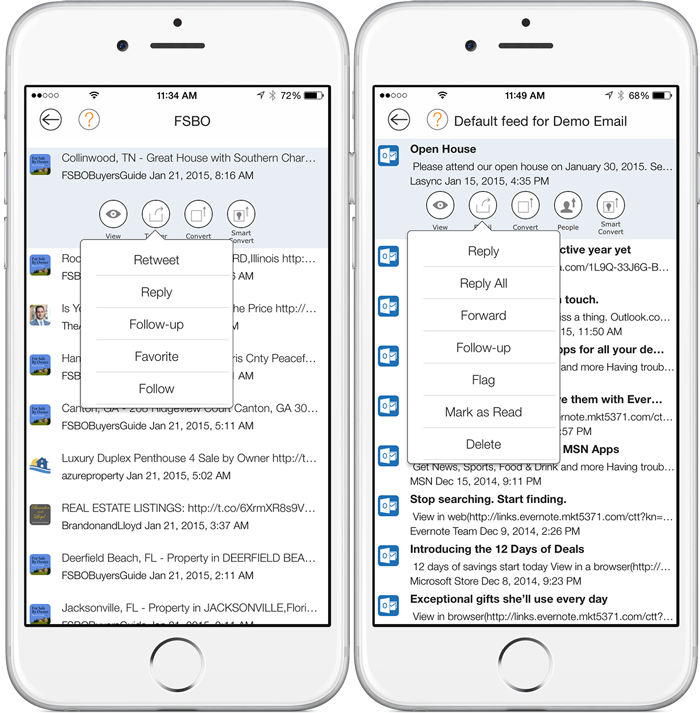 For example, with LifeTopix’s Pro.Inbox Pack, the real estate professional can gather information from multiple channels, including Twitter, Facebook, the Web, Email, and simply through jotting down ideas and notes (Quick Inbox). LifeTopix makes it easy to communicate with others from messages and posts gathered from multiple channels as demonstrated below. LifeTopix then goes one step further by allowing real estate professionals to make this information “actionable.” For example, Twitter posts can be converted to tasks, projects, appointments, notes, and more – which can be viewed directly on their LifeTopix calendar. View an example below. Real estate professionals are always looking for better ways to simplify expense tracking. With LifeTopix, real estate professionals can easily track expenses through the Finances topic. 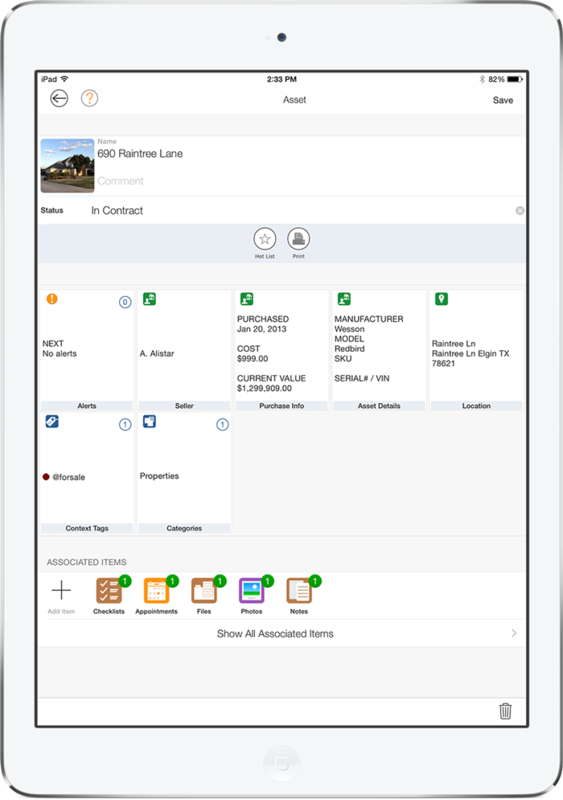 With LifeTopix, all the topics are naturally connected so users can add an expense directly to a property (asset) and then view it from the Expenses topic, as well. An example of a group of expenses associated with a property is shown below. Keeping track of associated receipts can also be a hassle for real estate professional, but LifeTopix makes it easy. Real estate professionals can simply take a photo of the receipt and associate it with the expense. 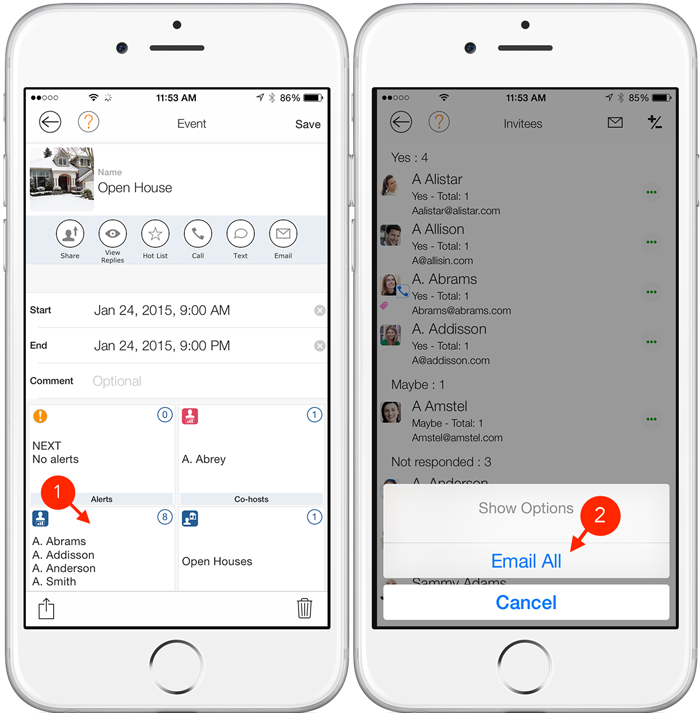 LifeTopix includes both basic management of contacts, and also offers advanced contact management with the Pro Contacts Pack in-app purchase. This pack adds Customer Relationship Management (CRM) and Contact Management features to enhance the real estate professionals’ sales activities. This add-on is a great choice for real estate professionals who want to keep track of leads, clients and business information for people. 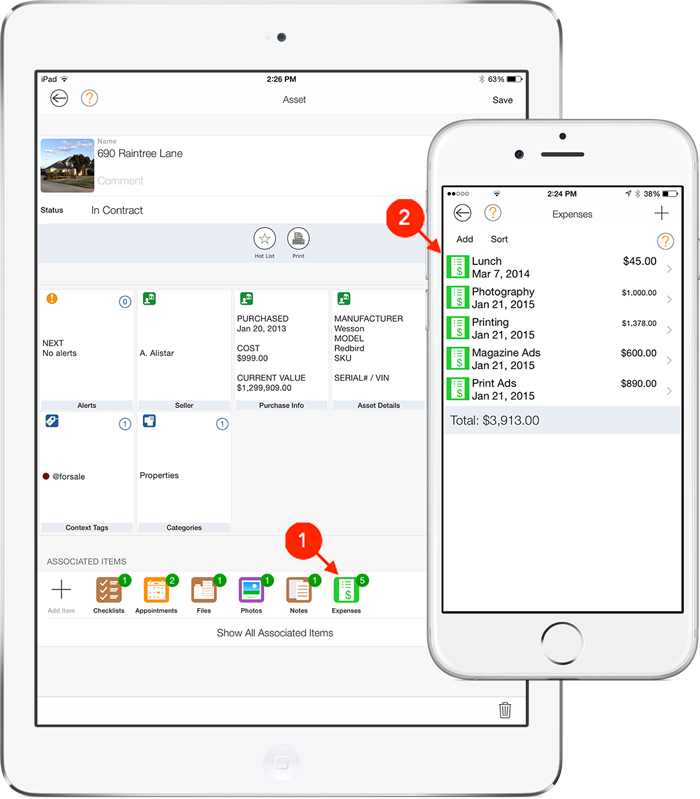 This in-app purchase allows real estate professionals to associate tasks, appointments, reminders, notes, files, bookmarks, and expenses with clients and contacts, allowing timely follow-ups and enhanced organization of information. It also adds a configurable spreadsheet-like view of contacts and CSV import/export, which gives real estate professionals an easy way to add, view, sort, and manage business information for multiple contacts. Real estate professionals have several contacts saved in their phones or Rolodexes, and they receive several email messages daily. 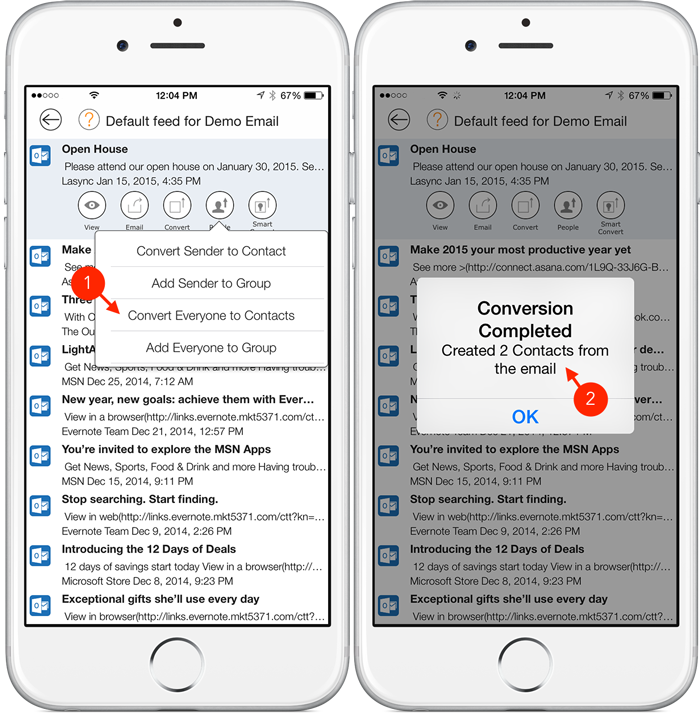 While other apps might pull information from multiple email inboxes and automatically add contacts, LifeTopix allows its users to choose which contacts to add directly from email messages. They can add all contacts from a single email message or add a single contact from a selected message. They can sort their contacts by groups and add contacts directly to specified groups (directly from an email message). The image below shows how this is done. Out-of-the-box, users can manage up to 100 contacts in LifeTopix. If they want to manage more contacts, extra contact packs are available via in-app purchases. Easily finding contact information for service providers while on the go is especially useful for the real estate professional. LifeTopix includes features for saving details for real estate attorneys, accountants, inspectors, surveyors, lenders, brokers, interior designers, and other service providers, which saves valuable time. In addition, the real estate professional can group providers into categories, rate providers, add online access (username and password) information, add location, and sort providers by rating. Want to Learn More About LifeTopix? 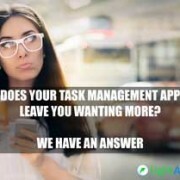 If you have questions about how LifeTopix can help you succeed and be more productive, you can learn more by visiting http://www.lightarrow.com or the App Store. LifeTopix is a full-featured app at $7.99 US with absolutely no subscription fees. In-app purchases can be utilized to add features as you go.